Spring’s splendor will take your breath away with more than 300,000 blooms! This spring, the sultry Flama Verna tulip sprinkled among The Top 40 daffodil blend will welcome you in the parking lot. As you enter the Fischer Visitor Center, be sure to take a peek at the Cretaceous tulip. This is a unique peony flowering tulip, so you might not recognize it at first glance! Once you’re in the garden, just wander and look for some of the new tulips blooming this year. In front of the Schierl Wellhouse is a tulip blend called Calm Cool Collective, something we can all aspire to and something I hope you’ll feel while walking the grounds! 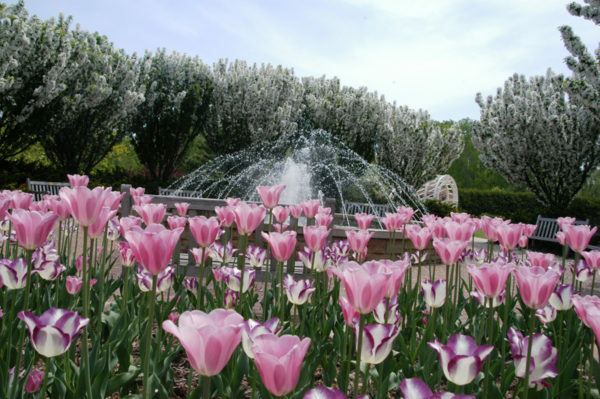 Planted in front of the Mable Thome Fountain this year is a blend of Mascotte (light pink) and Honeymoon (white) tulips. These tulips are fascinating and unlike many other tulips because the edges of their petals are fringed. Framing the Kaftan Lusthaus is a blend of purple and pink peony flowering tulips called Beyond Baroque. Several steps away, the Stumpf Belvedere also has an eye-catching combination of the hot-colored lily flowering tulip, Fire Wings, with the dark maroon fringed tulip Vincent Van Gogh. Mother Nature permitting, flowers bloom throughout May. Peak bloom is anticipated mid-May through the end of the month.